When Danielle Miller was 15 years old, she and her mother traveled from their Pennsylvanian home to the NBC TODAY Show set. There, she met longtime weather anchor Al Roker, an experience that has fueled her interest in broadcasting and weather forecasting. 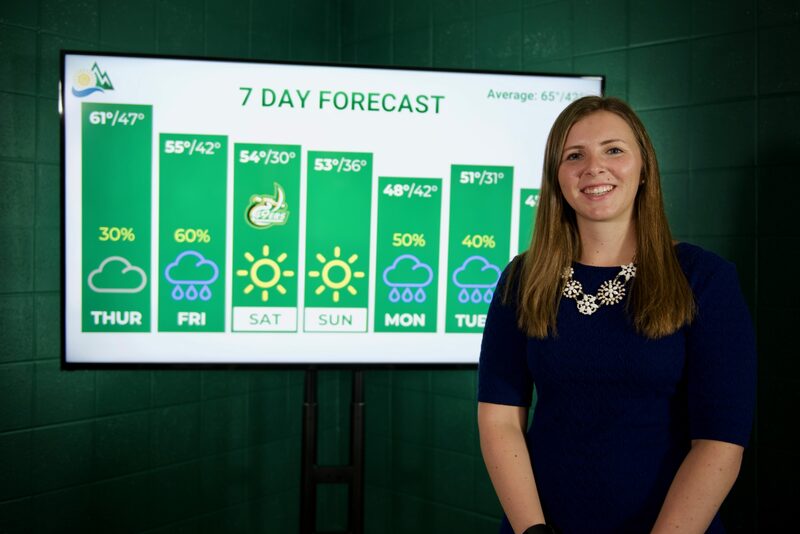 When she arrived at UNC Charlotte and settled into her major, she noticed that students who were studying meteorology lacked access to a practice studio. “We only had a small space in our lab with a green screen and this little web camera,” she said. “The quality was not great, and I know that students found it hard to get a job without a strong resume reel.” Resume reels are compilations of broadcasts that showcase a person’s best work. Addressing this concern became a major focus for Miller this year. With resources provided through the Levine Scholars Program and the Department of Geography & Earth Sciences, Miller led the effort to create a weather studio in the McEniry Building for meteorology students to use to hone their skills. As the spring 2019 semester approaches, faculty members also are considering how they can incorporate its use into some classes, and Miller and her fellow students will seek to expand resources available to students in the studio. We recently sat down with studio manager Miller to learn more about the efforts and her plans. Q: What prompted you to get the studio going? A. Even if students are not trying to be on television, they need good communication skills. Whether we’re working for the government or a private company, we need to be able to tell people what’s about to happen regarding the weather. The studio also is something that makes UNC Charlotte more competitive. This will help bring in some of those students that are looking for that kind of edge. Q: Can you explain in more detail what the weather studio is? A. We took over a small classroom in McEniry and painted it green, and we moved a large television screen in there, and we create materials so we can deliver weather forecasts. The department and technical support were invaluable help, particularly Patrick Jones and Adrian Jelley. Students are coming in here every morning at 8 a.m. with a forecast prepared, and we are doing live weathercasts. We are also doing short weathercasts for Niner Times. This is a real world application, in addition to what we’re learning in the classroom. Q: Is the process of forecasting and broadcasting more difficult than one might expect? A. The difficulty depends on how deeply we go into the science. We do 7-day forecasts. When we had the hurricanes coming, we did a lot of hurricane coverage. That takes a little longer to diagnose the situation and make sure we are telling the public accurate information. We also consider how long the information will be applicable. How you want to cater your message is really important as well. Building the show takes time, such as deciding how you want to communicate the messages. Creating the themes takes a little bit of time as well. We use a lot of online resources. We’re using weather models, government data, and satellite data. We’re really doing what we would do if we were working at the National Weather Service. We’re trying to stick to what we would be doing outside of school. Q: What was it like reporting on Hurricane Florence? A. I was really proud of our team. We did a good job of keeping up on the university updates. As soon as there was something announced, we were also on top of the message letting people know the status. We prepared a hurricane preparedness video one day, which I really enjoyed. We included tips on what you should do to stay prepared, such as if the power goes out, what emergency supplies should you have, and what kind of food should you buy. I would like to continue doing informational videos, for specific situations. People shared their videos and posts with us on social media. Q: What successes have you experienced related to your meteorology studies? A. 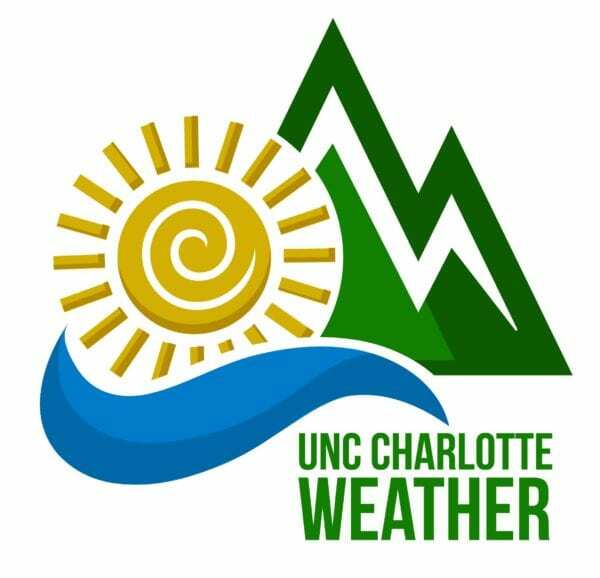 My biggest success story right now is that we have just launched this UNC Charlotte Weather Studio. Through the Levine Scholars Program, I applied for a grant, and I received funds to build the studio on campus. Currently, after building the studio, and planning that for the past two years, we were operational starting in the fall semester and we are doing daily forecasts for the campus. Also, the American Meteorological Society hosts a conference every year. Last year I attended in Austin, Texas. This past year I applied for a scholarship via the American Meteorology Society, and I was named one of their senior scholarship recipients. So I will be going back to the conference in January, this time in Phoenix, Arizona, and will be awarded this scholarship. Q: Have you held any internships related to meteorology? A. I interned at Discovery Place in uptown Charlotte, where I taught weather classes to fifth graders. We were using liquid nitrogen, making clouds on the floor, while we were teaching basic weather safety, and talking about wind, temperatures and other aspects of weather. Then this past summer, I was at AccuWeather. It was a competitive internship so I was really happy to have received it. That was in State College, Pennsylvania. I was forecasting on a daily basis, across the country and, on some occasions, across the world. We were doing newspaper forecasts and radio forecasts. I was briefing television stations in Raleigh about what to talk about, which I thought was really cool. To see my actual work and what I’ve been learning in school come to fruition and talking to senior meteorologists was just invaluable. Q: How have you incorporated meteorology into your Levine Scholars experiences? A. Within the Levine Scholars Program, I try to be an advocate for earth sciences majors. I think it’s great every time we get an earth sciences major in the program, and I encourage them to stick with it and also to do research. I am the first meteorology major within the Levine Scholars Program, so that was fun, and as soon as I came in as a freshman, everyone in the program was saying, ‘Oh you’re the weather girl. We’ve heard about you.” I would love to get more students who are interested in earth sciences applying to the Levine Scholars Program as they apply for school here. It’s a great opportunity. Q: Can you elaborate on your desired impact on students with the weather studio and social media efforts? A. Right now we get a good amount of views on our social media channels. We have 3,500 Twitter followers, 200 Instagram followers and 500 plus Facebook likes. We also partner with Niner Times, which uses our videos. I would like to increase our following and our viewership, and I want students to view us as a resource to know exactly what’s happening on our campus to keep students more aware. We have almost 30,000 students here right now, so I think we could have a really big impact on campus just to keep everyone weather aware. A goal I share with one of the video editors from Niner Times is to one day start a newscast. My team could provide weather, and her team could provide news stories. We want to create more of a media space, so we can go out in the Charlotte community and tell the stories of what’s happening. Q: What’s next with the studio? A. For the studio, after I graduate, I want other students to continue forecasting every single morning and creating graphics, telling people what the 7-day forecast is looking like and even forecasting for football games for the 49ers. I would love to see that continue and for students to continue to step up and enjoy and use the studio space as it was built to be used. Q. What does the future hold for you? A. Personally, I will be applying for jobs in the spring. I would like to go into broadcast meteorology. And any way that I can help others and be a resource after graduation, I would definitely be available to students to help them out in whatever they need.